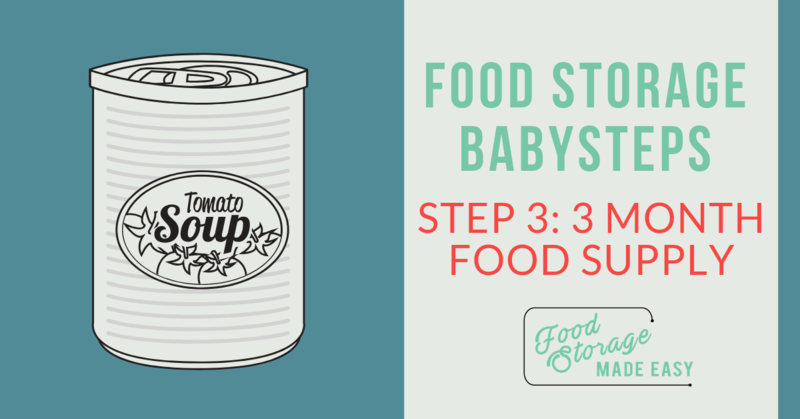 Purchase a three month food supply consisting of foods you normally eat. You can come up with meal plans for the full 90 days, or just buy extras of things you use a lot. Ask yourself these five three month supply questions to help you get started with the planning process. Make a list of foods you eat on a regular basis, and determine how much you would go through in three months. Use and rotate these foods in all your daily cooking. Constantly replenish the stocks of these foods as they go on sale again. Don’t forget to include non-food items in this step as well. Get a 3 month supply of NECESSITIES such as diapers, medications, toilet paper, toiletries, etc. For a great list and tracker, see our 3 month plan spreadsheet. Benefits include: saving money by buying foods on sale and having foods you normally eat in times of economic or any other type of hardship. We have developed a 3 Month Food Supply Excel Worksheet that will help you outline meal plans, convert them into the number of items you need to buy automatically, and then track your inventory including current prices for each product. We highly recommend viewing our short BASIC Tutorial Video before you start inputting information into your spreadsheet. If you aren’t familiar with excel this will make it seem so easy! For more in depth information on the spreadsheets additional features such as the “Common Foods Sheet”, “Non-Food Items Sheet”, working with copy/paste, and adding or deleting lines, see the EXTRA Tutorial Video. For those of you who do not have the excel program, we have made a way for you to make your 3 month food supply plan with these printable forms. There is an Instruction Sheet, a Menu Plan Sheet and an Inventory Sheet. You will need to print the Menu Plan Sheet multiple times depending on how many different meals you want to plan. There is also a video tutorial to go along with these printable forms found here. You could also try using the free program Open Office if you really want the spreadsheet format. A wonderful service to help you find the cheapest prices on all your groceries. At just $5 a month you break even with ONE shopping trip. Learn more and sign up for a free two week trial to test it out yourself!